There is a wealth of objects and local characters for the artists to respond to. Hastings is and, it seems, always was full of eccentrics, one-offs, fakers, the good, the bad and the downright ugly. The artists have picked from the myriad of exhibits that are wild and wonderful and meander through food, ritual, death, natural history, costumes, music and games, North American Indians, archaeology, ornithology, Robert Tressell’s The Ragged-Trousered Philanthropists, an 18th century schoolmaster’s diary, fakes, photography and ancient vessels to the battles between the Mods and Rockers. Having thoroughly researched and filtered it through their creative eyes they have come up with fresh, interesting, surprising results. Jean Davey Winter’s subject is North American Indians. There is the old imposter Grey Owl, but there are also artefacts relating to the Indians in the museum and this chimed with a recent trip of Jean’s to Montana. 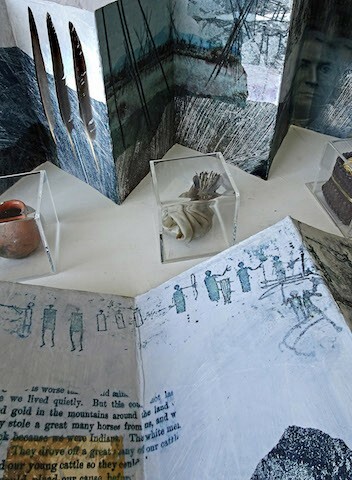 From her initial photographs of ghostly, tepee spines she has created beautiful concertina-ed books with images and text from the internet and monoprints, collaged and layered. There are also feathers that would have been used as offerings and in head dresses plus small offering artefacts filled with made and found objects. Reflecting Tressell’s The Ragged-Trousered Philanthropists Kathleen Mullaniff has created her own series of large, black and white drawings of women labouring in the textile industry. Because I love photography and stories I was captivated by Maggie Henton’s take on old images. From an uncle’s collection of old photographs she wondered why men had been excised from some family photographs. Finding some undamaged duplicates she reinstated the men into the images and back into family history. They make interesting ruminations on old photographs where ancestors and narratives have been lost in the mists of time. There have been many fakeries over the years, from Grey Owl to George Bristow’s ornithological, rarities fraud – and who knows what else? Hastings Museum itself was not exempt from forgeries: its founder, Charles Dawson (1864-1916), wrongly attributed dates or methods of construction that were not used until much later. He made some spectacular finds, like a so-called ‘prehistoric hammer’ and Piltdown Man – the supposed missing link between man and ape – which were later exposed as fakes: Piltdown Man proved to be a human skull and an ape’s skull cobbled together. Oona Ball has created her own ‘fake’ objects. They are so well executed you wouldn’t suspect they weren’t real – although you might wonder what they are doing in certain cabinets. 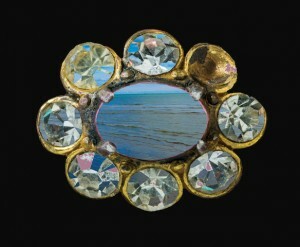 Sineid Codd has inserted her local seascape photographs into found jewellery creating her own personal mementos. Sue Johnson has used traditional textile and dyeing methods to make her own contemporary textiles; there are paintings of ancient vessels, landscapes, local characters. Adrienne Hunter has taken William Henry Borrow’s 19th century views from the East Hill, drawing the primordial cliffs today. Discovering William Morris original wallpaper sketches, Roz Cran gained permission to trace over them. And with birds disappearing from the countryside Jim Northover has celebrated the near extinction of the slender billed curlew. Mary Morris reimagines the diary of Walter Gale, an 18th century Mayfield schoolmaster, with a cabinet of possible local finds and local landscape in her textiles and exquisitely made and found objects. Intriguing is Carly Ralph’s reaction to the ritual of samurai armour; she has created textiles decorated with found objects of nails and steel. The SOCO artists have embraced this project and run with it. After thorough research they have turned their creative vision to ways they could reflect and reinterpret some of the exhibits in fresh ways. An exhilarating and surprising exhibition. SOCO Artists involved: Oona Ball, Sineid Codd, Roz Cran, Jean Davey Winter, Maggie Henton, Adrienne Hunter, Sue Johnson, Alex Leadbeater, Mary Morris, Kathleen Mullaniff, Jim Northover, Carly Ralph, Helen Scalway, Charlotte Snook. 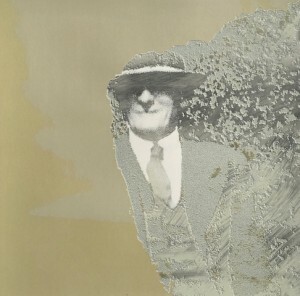 SOCO Collect is at Hastings Museum and Art Gallery, John’s Place, Bohemia Road, Hastings TN34 1ET until 30 September. Open Tuesday-Saturday 10am-5pm, Sunday 12 noon-5pm.